This short document serves to illustrate how Litmus is able to assist any school in the UK with any future facilities related tender requirements, briefly sets out the range of services we can provide, estimates the funding requirement and provides details of payment options. The Litmus Partnership has been named as a supplier on the Crown Commercial Service’s (CCS) Framework Agreement for the provision of Management Consultancy Services, Agreement Ref: RM6008. The Crown Commercial Service (CCS) supports the public sector to achieve maximum commercial value when procuring common goods and services. 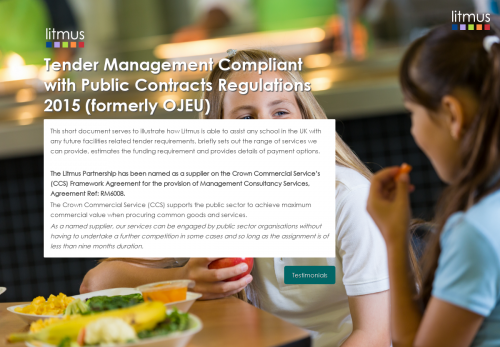 As a named supplier, our services can be engaged by public sector organisations without having to undertake a further competition, so long as the assignment is of less than nine months duration.